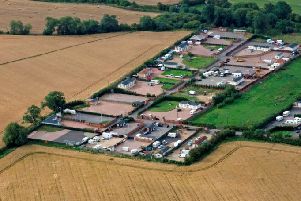 Potton residents are still having issues with people from the town’s traveller site, a meeting of the council has heard. It was the second public meeting organised by Potton Town Council in 2018 following complaints about anti-social behaviour. The first was held in September. Residents told the meeting they had issues in December with travellers trying to remove items from gardens. One said two people tried to remove a hot water cylinder from a house on the corner of Chapman Close and Willow Road. They were stopped and the cylinder moved but they were later spotted trying to take it again. A contractor installing an artifical lawn on Willow Road found his van had been taken. The meeting, at The Pavilion on December 13, heard he tracked it to the traveller’s site in Potton and called police. Superintendent Jim Lunn of Bedfordshire Police denied claims his officers were refusing to go on the site and said police had gone onto the site, on Common Road on December 11 with the owner of a vehicle, to help retrieve it. Cllr Doreen Gurney told the meeting she believed the Central Bedfordshire Council dedicated traveller site manager was too afraid to go onto the site and she herself had been threatened on her own doorstep by travellers and was now afraid to visit the site, for the first time in 35 years. But PCSO Ann Jeeves said she was not afraid to go on the site, which has a total of 15 plots. The meeting also heard that issues on Wingfield Road, which had been reported at the July meeting, were now under control. Residents also raised the issue of speeding in the area. There were concerns over speeding on Wrestlingworth Road and a call was made to extend tge 40mph limit after reports of cars crashing through garden fences on a blind bend on the road. The council said they had written to CBC Highways but were awaiting a reply. Speed humps are planned for Common Road. On December 21, Central Bedfordshire Council obtained a court order to remove travellers from an unauthorised site near the official travellers site. Adding another security camera on Common Road is also being considered. A further public meeting is planned for March this year.